A beer and a sandwich. It is a combination as inherently simple as it is deeply satisfying. And the possibilities are endless! A complex, gourmet-grade sandwich with a masterful combination of meats, cheeses, veggies, and other accoutrements, accompanied by a robust porter. Something more basic, like a pastrami sandwich with a crisp pilsner. Or maybe…in a pinch…a PB&J and a PBR (don’t look at me like that, you’ve been there too). A sandwich and a beer is about as straightforward as you can get. Bread, meat, cheese, veggies, hops, and barley. Have someone pass you the remote, and you’re on your way to a pretty decent afternoon. You can easily whip this up at home, but let’s face it – a sandwich always tastes better when someone else makes it, and a beer always looks more enticing when it’s streaming out of a tap. That said, you can find a good sandwich anywhere in Boston. But as far as I know, there’s only one place where you can get good sandwiches from everywhere in Boston. 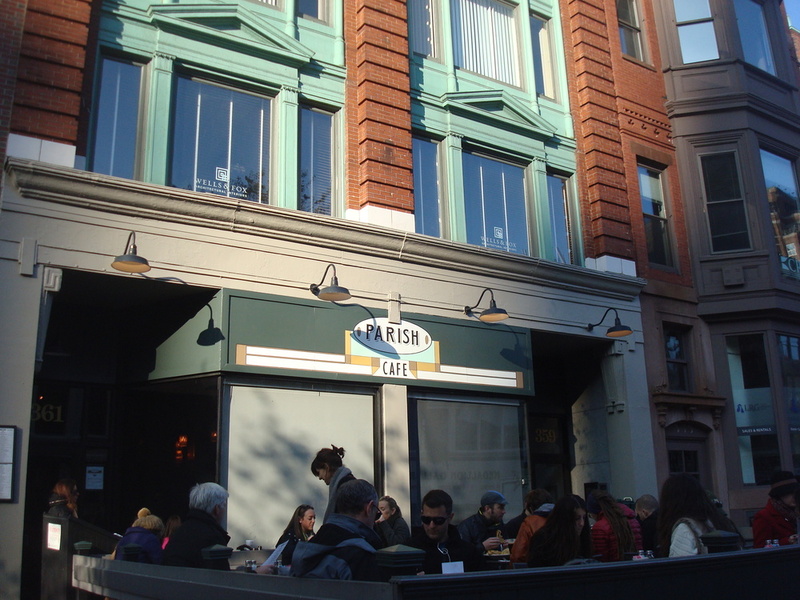 The Parish Café is a Back Bay institution with a simple, unique concept – a menu of sandwiches designed by renowned chefs at some of the top restaurants in Boston. Each sandwich bears the name of its respective restaurant or chef and reflects the style of that eatery’s cuisine. Not that Parish relies solely on the culinary kindness of strangers; their own chefs contribute sandwiches and entrées as well. And since that results in a pretty broad array of flavors and styles, there’s a killer beer list to match your selection. It’s a basic formula, but one that has garnered Parish Café widespread critical acclaim, occasional celebrity guests, and countless fans. 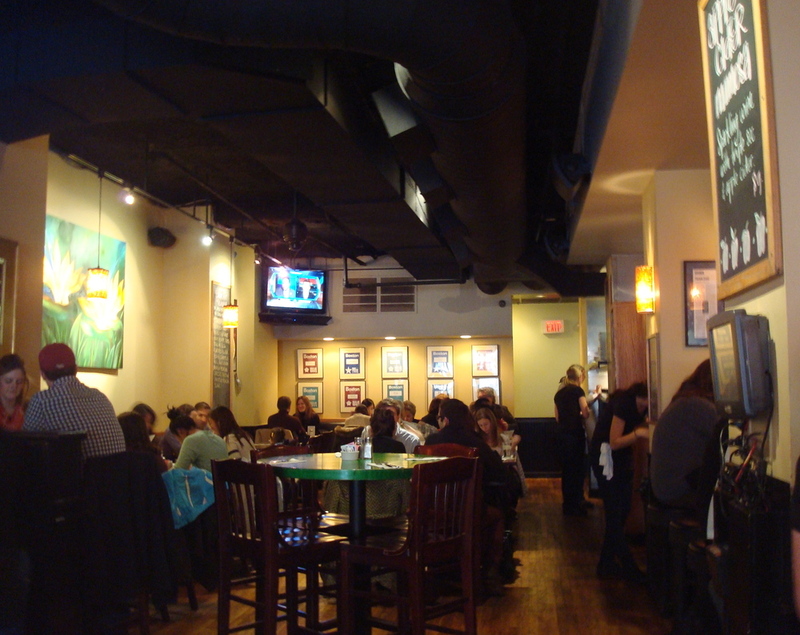 Its walls are adorned with Best of Boston awards, glowing published reviews, and a host of other accolades. You’ll have plenty of time to peruse them while you’re standing in line, which is nearly inevitable if you want a table. I recently visited the Parish Café with one of my oldest and most difficult friends, Christine. I arrived at 5:30 on a Thursday and found about 25 people at the bar, although most of the tables in the dining area were still free (it wasn’t until later that I realized what a novelty this was). The interior is fairly small, with a modern, casual feel. It has something of an autumnal glow, with warm orange lights, a black ceiling, cream-colored walls, and worn, brown hardwood floors. There’s a long, curvy bar with a handsome, dark wood top and about 17 stools. Ten or so tables are squeezed into the bar area, and another 10 to 12 fill up the dining area. The mirrored wall behind the bar is an attractive touch and makes the space look a little bigger than it is. 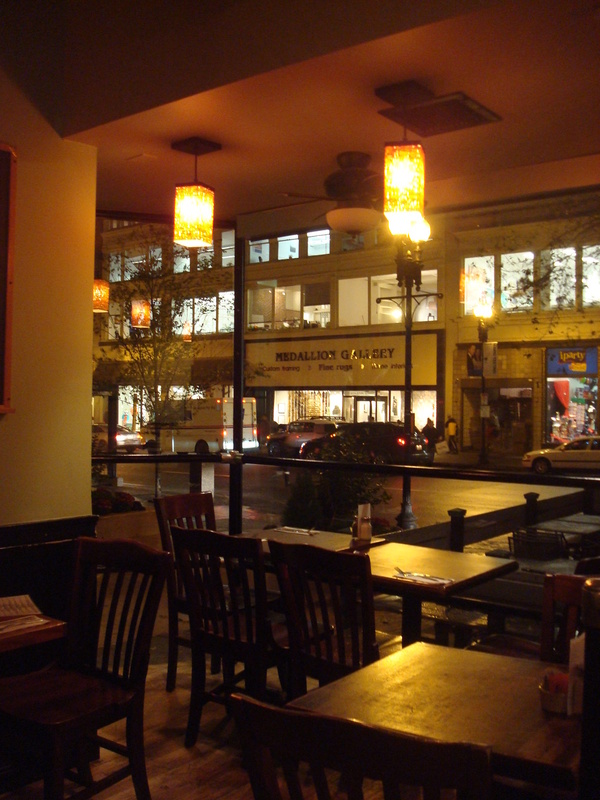 There’s also an outdoor patio in front for the warmer months; if people watching is your thing, you can’t pick a much better spot than Boylston Street. Since Christine was heading into town from distant lands and I had time to kill, I grabbed one of the few remaining seats at the bar and took a look at the cocktail list. Like the sandwich menu, about half of the drinks are designed by area mixologists, while the rest are Parish Café originals. 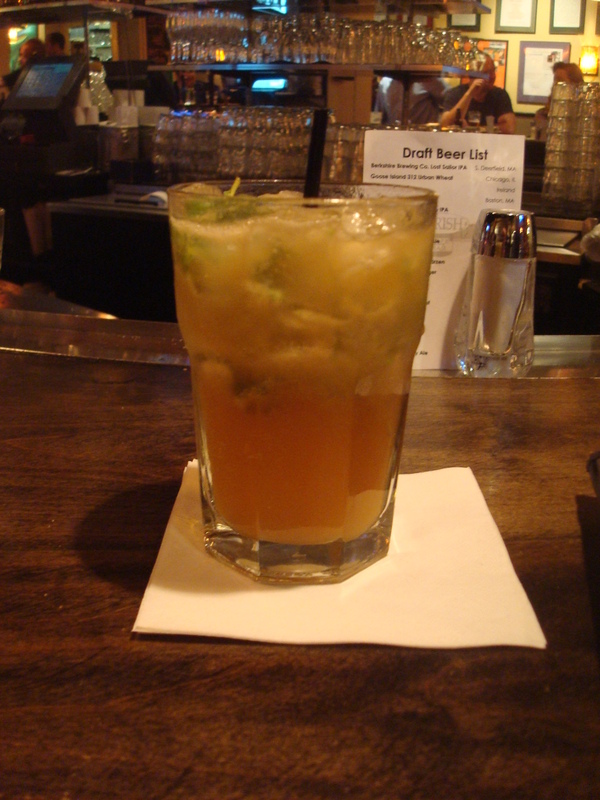 Although it was November, Parish was still peddling “Summer Cocktails.” Nothing says autumn like a watermelon mojito, right? I wasn’t going to let an outdated label deter me, but it would have been cool to see what they could devise for fall or winter cocktail offerings. 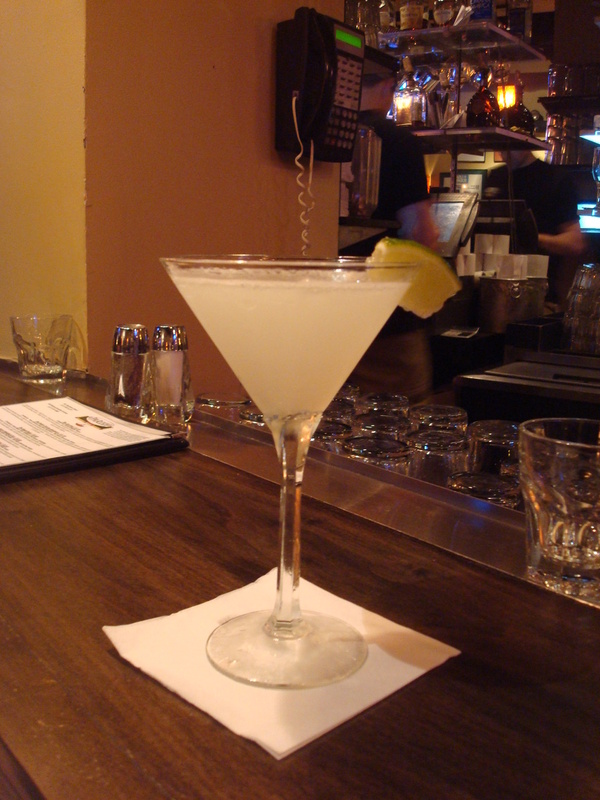 I began with the drink with the coolest name on the menu – the Wandering Poet, concocted by Jen Jasmin of Via Matta, a Back Bay Italian restaurant. 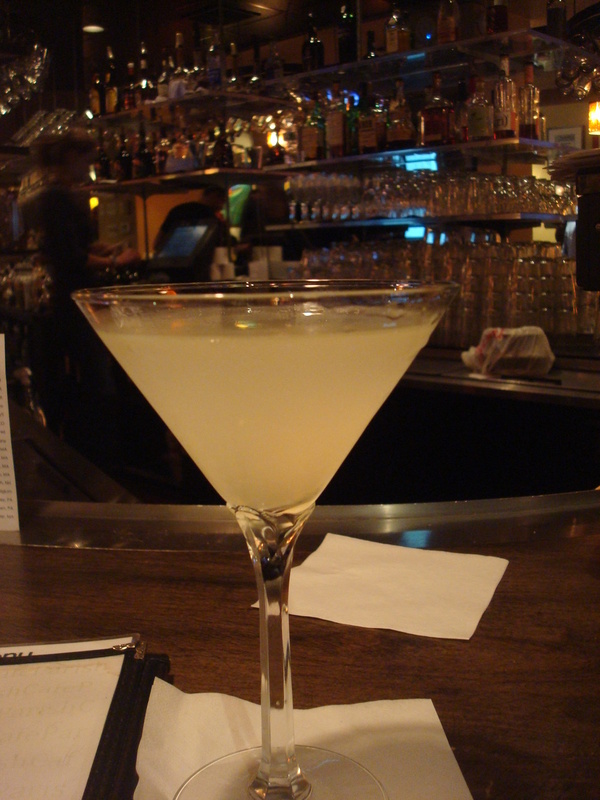 A combo of Absolute Vanilla vodka, triple sec, fresh lime juice, simple syrup, and sour mix, it reminded me somewhat of a SweeTart candy. It was a light, refreshing drink that, on a raw November evening, gave me bittersweet visions of warmer weather. The Peach Smash, on the other hand, I’d drink all year round. A Parish Café original, this was a smooth mix of Maker’s Mark bourbon, Domaine de Canton ginger liqueur, white peach puree, simple syrup, fresh mint, sweet vermouth, and ginger ale. I found it to be a fresh combination of flavors, with the peach puree giving it a pleasantly creamy texture. After an hour or so, I figured Christine must be walking to Boston, and I needed something to tide me over. The appetizer menu offered a few unusual items, like vegetarian corn cakes, and an oversize meatball. Drawn as I was to the novelty of ordering an oversize meatball, I settled on the roasted “reggae” wings, marinated in Jamaican jerk spices, fresh citrus, and soy, and served with a banana mango chutney. Juicy and tender, they were the perfect pre-sandwich snack. The meat not only fell right off the bone – it would barely stay on the bone. The sweet heat of the chutney was a welcome accompaniment, though the banana flavor really stood out (I could have done without it). Myself, I was long done with cocktails at that point and eyeing Parish’s top-notch beer selection. They’ve got about 20 beers on draft and at least another 50 or so in bottles, helpfully organized on the menu by type (lagers, Belgians, brown ales, etc.). The Fisherman’s Imperial Pumpkin Stout immediately caught my eye, but the bartender cautioned me that it was $18 a bottle; I respectfully declined. 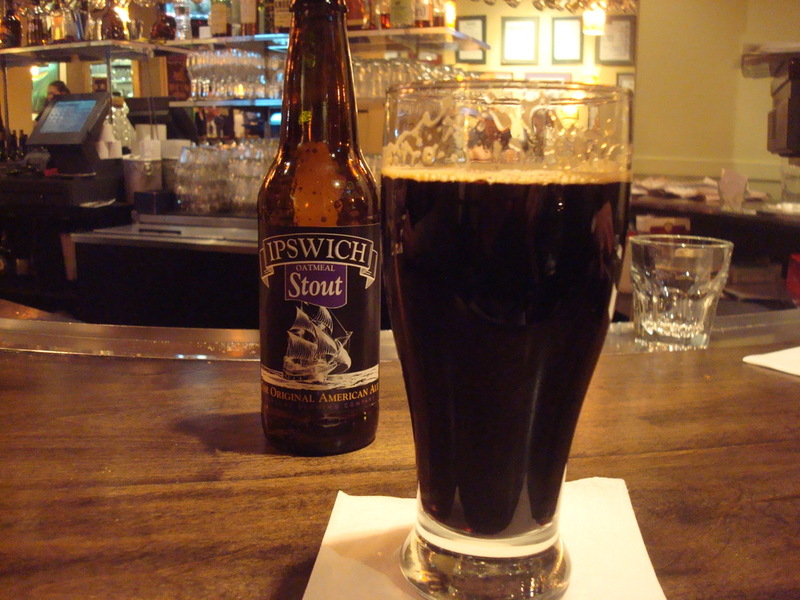 I went instead with the Ipswich Oatmeal Stout, shifting into a winter mode after my summery libations. Now if you’re a serious beer drinker and plan to spend a tremendous amount of your time at the Parish Café, you can join their Mug Club. All you have to do is drink all 125 of their beer offerings within six months, and you’re rewarded with your very own 25-ounce glass beer stein to use whenever you visit. You can even have it personalized. Whether the economics are in your favor, only you can decide. But the club’s mugs hang above the bar, challenging you to join their ranks. Impressive as the beer list is, the sandwiches are the true draw here. Ranging from simple to fancy, with a bevy of meaty, vegetarian, and seafood options to choose from, there’s something for every palate. And if you enjoy all of the above, good luck deciding what to get. I’d been scrutinizing the menu the entire time I waited for Christine, and when it came time to order, I was still no closer to making my mind up. The pork belly sandwich from the chef at Coppa and Toro? The crabmeat sandwich from fancy schmancy L’Espalier? The Blue Ginger, a sandwich of tuna steak, grilled rare, fashioned by the Wellesley restaurant of the same name? I narrowed my options to three: the Mexican meatball sub, by Brian Poe, and two Parish Café originals – a chipotle meatloaf sandwich and a steak sandwich. Tempting as it was, I eliminated the meatball sub; since I was already familiar with Brian Poe’s handiwork as the executive chef of the Rattlesnake Bar and Grill and the newer Tip Tap Room, I figured I should branch out a bit. Still torn, I asked the bartender to settle my meatloaf v. steak dilemma, and he advocated for the latter. 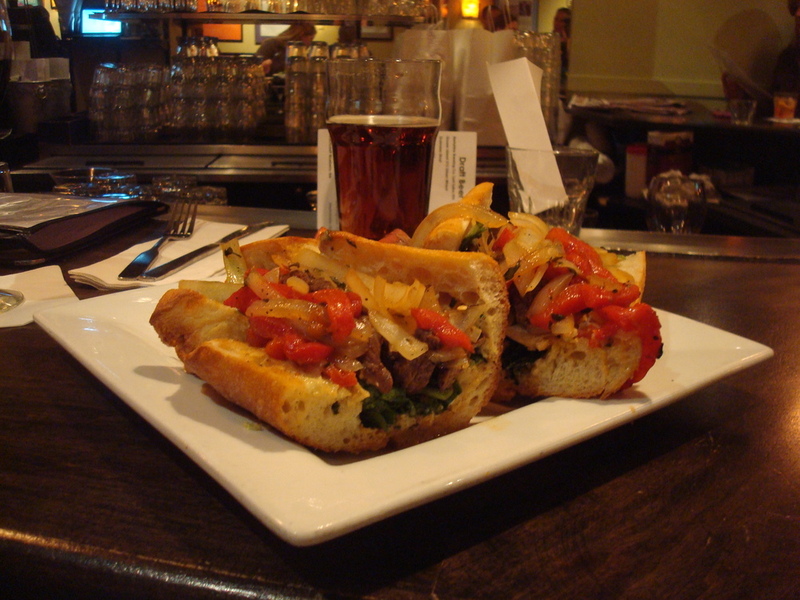 The Vieira, named after Parish sous chef Ederson Vieira, consisted of pounded, sliced flank steak in a soy, chili, and garlic marinade, sautéed, on an Italian sub roll with roasted red peppers, watercress, onions, and a homemade basil aioli. The steak was juicy; the sandwich, full of flavor. I wondered why I’d had so much trouble deciding on it. 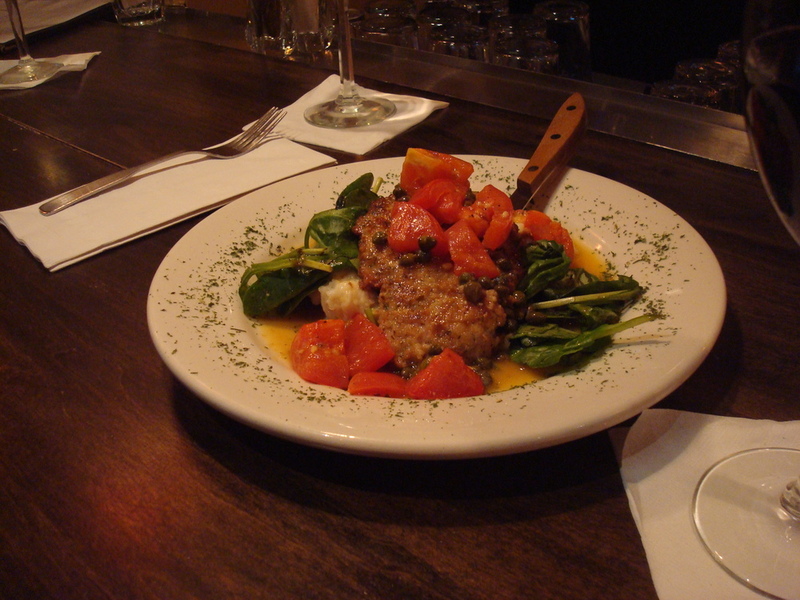 She opted for Sean’s Simple Chicken, presumably devised by Parish’s executive chef, Sean Simmons – pounded, breaded chicken cutlets served with chopped tomatoes and capers, and served over garlic-mashed potatoes and baby spinach. 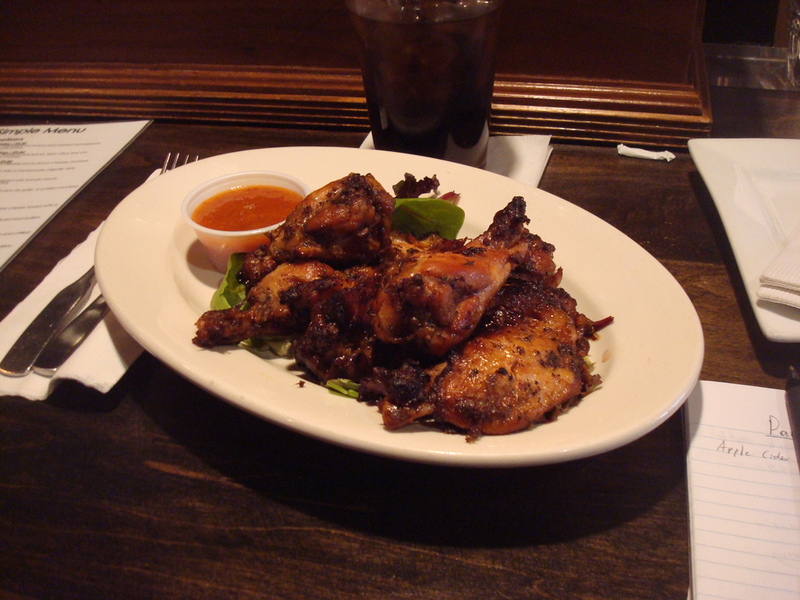 Conveniently, like all of Parish’s entrées, it comes in both a full order and half order. Christine opted for the half order and regretted it; she deemed the chicken delicious and wished she’d gone with the full serving. Parish was crowded the entire time we were there, the line for tables growing longer as the hours passed. The tables in the dining area looked pretty crammed, but our spot at the bar was surprisingly comfortable and roomy. Despite the volume of customers, we didn’t have people constantly reaching over our food to retrieve a drink. 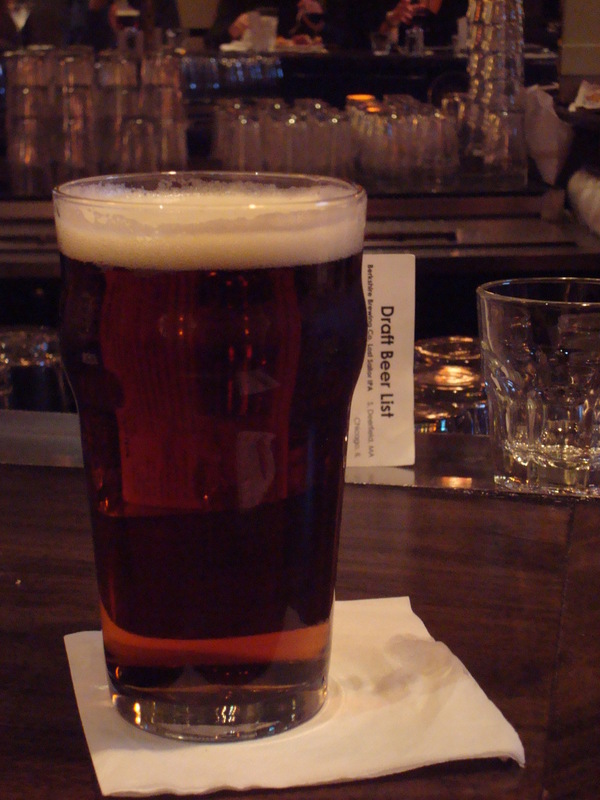 I closed out with one more beer, a Paulaner Oktoberfest Marzen (which was just OK). I explained to Christine how helpful it is, from a blogging standpoint, if we both order a few different beers from a place like Parish, which has such a broad selection. She got a glass of wine. The restaurant business is notoriously cutthroat, but Parish Café turns the concept of competition on its head – competing chefs contributing original recipes; Parish advertising the wares of competing chefs. It’s an unexpected approach, but it seems like everyone wins. Customers perusing the menu get a sense of other good eateries in Boston, and maybe they’ll go check them out. Yet they’ll probably come back to Parish, too, because of the variety. And boy do they come back. I walked by on a gorgeous fall Saturday afternoon to find the outdoor seating area full, a line for tables inside, and a packed bar area. I even returned on a Sunday at noon, and there was a line at the door before the place even opened. But don’t let the crowds deter you. Most of them will tell you that Parish’s sandwiches are worth the wait. There’s also a pretty quick turnover at the bar; you usually don’t have to wait much more than 5 or 10 minutes for a seat. Prices are fairly reasonable, for the most part. The sandwiches range from about $12 to $19, but there are only a couple at the upper end of that range. They’re also good-sized and, from my experience, very well made. The entrées were all under $15, and you can get a half order if you’re feeling thrifty (or counting calories). The cocktails ranged from $8.50 to $12, which isn’t bad. The selection of microbrews is highly respectable, and the beers I had ranged from $6.50 to $7.50; a little on the high side, but not the worst I’ve seen. Parish’s enduring popularity led to the opening of a second location, in the South End, in 2010. It’s the same idea, the same eclectic sandwich menu, and the same result – a true taste of Boston.